− 1 = 6 Required Please enter the correct value. 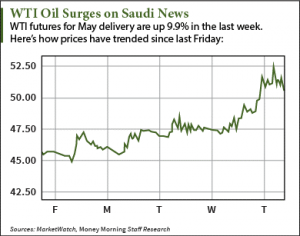 The reasons why crude oil prices today are rising stem from escalating violence between Saudi Arabia and Yemen. By 9:40 a.m. today, WTI oil prices were up 2.97% to $50.67 a barrel. It was the second straight impressive day for the U.S. benchmark. It gained 6.6% on Wednesday alone. Brent crude prices were up 2.5% to $57.89 a barrel this morning. Brent also went on a Wednesday tear, jumping 3.9% by market close. The boosts came after Saudi Arabia and its allies launched airstrikes against rebel forces across Yemen. The attacks began early this morning after Yemen President Abed Rabbo Mansour Hadi fled the country by boat as insurgents closed in. Although Yemen isn't a big oil producer, the conflict threatens the stability of the neighboring Bab el-Mandeb strait. The waterway is a global transit point for seaborne trading and its closure could prevent oil tankers from reaching the Suez Canal. According to the Energy Information Administration (EIA), the violence could shut down this quick route for tankers traveling from North Africa to Asia. "Good thing we have lots of oil in stocks in the U.S., but don't forget that those crude stocks are not exportable into the global market place," explained Bjarne Schieldrop, chief commodities analyst at SEB Markets, in a statement. "The risk for oil supply disruption due to this conflict is low, but the bullish fear reaction on the back of the headline alone is very strong." 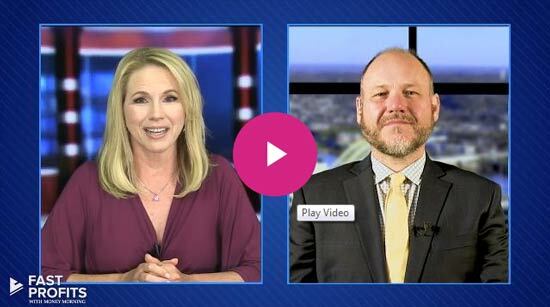 Money Morning Global Energy Strategist Dr. Kent Moors says there are macro-level reasons why crude oil prices today are rising, and will continue to slowly rise in 2015. "A number of factors are emerging that indicate oil prices will be going up, but hardly to the levels needed by the countries most dependent on oil revenues," Moors noted. "In short, we're not headed back to triple-digit oil prices any time soon." While oil prices slowly inch up, a new energy balance is developing at a remarkable pace. Oil will remain crucial – but it will no longer dominate the market like it did in the past. This will open huge profit opportunities across the energy spectrum. Investments in oil, natural gas, and renewable energy will all become long-term profit plays. According to Moors, we're at the dawn of a "new energy age" – and it's going to be a remarkable ride…continue reading about those profit opportunities here.